The Rock of Ages honor is given each year to those who have provided long-standing support to SourcePoint. This year’s two recipients, Joan W. Lawrence and the Franklin Foundation, Inc. were recognized at the organization’s Impact Lunch Dec. 20. 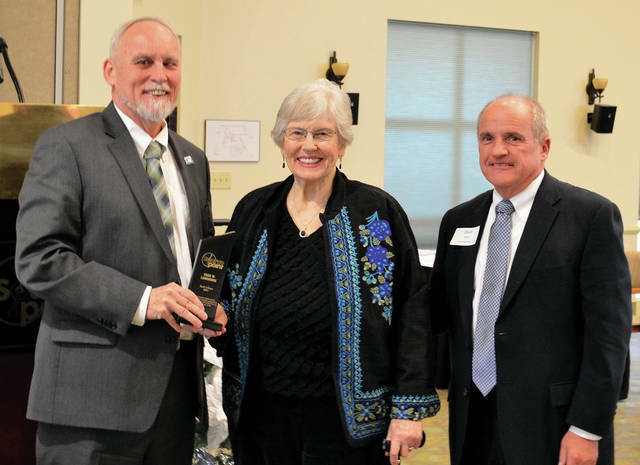 Pictured from left are SourcePoint Executive Director Robert Horrocks, honoree Joan W. Lawrence, and SourcePoint Board of Directors President David Black. The Rock of Ages honor is given each year to those who have provided long-standing support to SourcePoint. This year’s two recipients, Joan W. Lawrence and the Franklin Foundation, Inc. were recognized at the organization’s Impact Lunch Dec. 20. 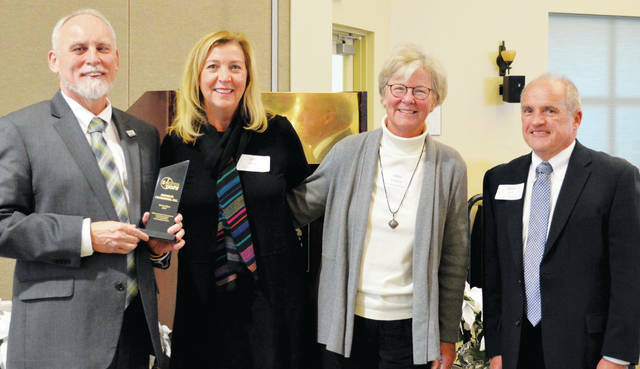 Pictured from left to right are SourcePoint Executive Director Robert Horrocks, honorees Franklin Foundation President Lynn Dalton, Franklin Foundation board member Ellen Havens Hardymon, and SourcePoint Board of Directors President David Black. SourcePoint presented Joan W. Lawrence and the Franklin Foundation, Inc. with Rock of Ages awards at the Impact Lunch Dec. 20. Nearly 120 supporters from the community attended the annual luncheon to honor the award winners, recognize SourcePoint’s 2017 achievements, and celebrate the organization’s 25th anniversary. The Rock of Ages award was created by the SourcePoint Board of Directors to honor those who have provided long-standing support to the organization. Each year, awards are presented to an individual and to an organization. Previous Rock of Ages award recipients include: Luella Yarnell and Grady Memorial Hospital/OhioHealth in 2012; Debbie Martin and DCB Delaware County Bank in 2013; Brenda Durfey and Interim Healthcare in 2014; Jerome Driesen and Manos, Martin & Pergram, LLC in 2015; and Beth Fisher and Willow Brook Christian Communities in 2016. This year’s individual Rock of Ages award winner was Joan W. Lawrence. Lawrence served eight consecutive terms in the Ohio House of Representatives, representing Delaware, Morrow, and part of Richland counties, and serving on the Human Services Subcommittee, as well as Finance and Appropriations, Health, Retirement and Aging, and Energy and the Environment committees. Lawrence served as the director of the Ohio Department of Aging until 2005 and joined the SourcePoint Board of Directors in 2015. The organizational Rock of Ages award was presented to the Franklin Foundation, Inc., and accepted by the foundation’s president, Lynn Dalton. Franklin Foundation, Inc. is a private nonprofit organization created by the John F. Havens Family in 1986 that supports care and housing for older adults by developing affordable housing. The foundation owns or supports 356 independent living units throughout Ohio and works closely with community leaders and local nonprofits, such as SourcePoint. Since 1994, the Franklin Foundation has given SourcePoint an annual gift via the United Way of Delaware County. SourcePoint also recognized the year’s community partners, including 40 providers of in-home care services, as well as 18 grantees. The 2017 Impact Lunch was sponsored by Powell Senior Living Communities, The Inn at Olentangy Trail, and Comfort Keepers.